Enjoy beautiful sunsets over the water! This house is solely managed by the owner. Discover the charm of a quiet, waterfront location. Enjoy sunsets over the water at this lakefront beauty. The cul-de-sac location offers solitude away from busy streets yet close (walking distance) to the neighborhood shops. It's just 1000 feet to the ocean & some the east coast's best beaches - literally a 5-minute walk across community boardwalks. You can reach off-road, 4-wheel drive, beach access one mile to the south. SURFDANCER is a gorgeous lakefront property with two master bedrooms, a large great room, a well equipped kitchen, and includes a community pool and tennis. The entry level has an enclosed outside shower, fish prep table, storage space for surf- and sail-boards beneath the house, under house entry with concrete driveway, and great parking. The second level offers a lakefront master bedroom (king bed) with private full bath, a second bedroom with two singles opening to a shaded deck, a third bedroom with two bunk beds, a full bath, and a utility room with large washer and dryer. The top floor features a second master bedroom (queen bed) facing the ocean, with a private deck and a full bath next to it. Also on the top level, you will find a large vaulted great room with spacious dining area and well-equipped kitchen and screened porch overlooking the lake. SURFDANCER is the perfect affordable vacation spot! Surfdancer, its sister house (Maestrale), and owner Glen Morgan were featured in a Wall Street Journal article about vacation rentals on February 15, 2013! *This house is totally MANAGED by the OWNER. *Surfdancer rents SUN-SUN: Avoid the Saturday traffic! *Partial weeks (3 night min) only considered within 2 weeks of rental period (if they fall between Sunday-Sunday). *Maximum house capacity - 8 people. *Sorry - but No Smoking and No Pets (no exceptions)! * The uncrowded, pristine beach (voted best on the coast) is perfect for families. * Amenities include membership in Kinnakeet Shores Resort Pool & tennis. * Want to explore? Take the ferry from Hatteras Village to Ocracoke Island, home of the infamous pirate, Blackbeard. *Visit the Wright Brothers Memorial and Museum and the Dunes at Jockey's Ridge State Park (50 miles north). * Fisherman can choose surfcasting, inlet fishing, ocean fishing at Avon Pier, or sport fishing offshore for flounder, drum, blues, mackerel, tuna, and more. * Discover multiple intimate restaurants with the Outer Banks own brand of beach hospitality rarely seen in vacation destinations. * Surfers can take advantage of the location central to the Outer Banks hottest surf spots including Hatteras Light House, S-Turns, and Frisco Pier. * Windsurfers, Kiteboarders, and Kayakers can access the warm, shallow waters of Pamlico Sound with just short walk. World famous Canadian Hole Haul-over day use area and Kite Point are about 2 miles south of the house. I'm a researcher at the National Cancer Institute of NIH. My love-affair with the Atlantic's barrier islands began during my summers as a lifeguard on Assateague Island in Maryland. As surfing developed into a passion, I began to venture to Hatteras Island since it was the ideal water-sports playground in a pristine natural seashore setting. My two sons loved the beach when they were young, and continued to enjoy Hatteras as teens and now, as adults. Avon on Hatteras Island is the anchor where all the generations of my extended family love to get together on an annual basis. And, yes, I am still surfing - with the same crew - in Hatteras! After 20 years of vacationing in the Outer Banks, I had a pretty good idea of what all of the locations and villages had to offer. The northern part of the Outer Banks is too over-developed to suit me. 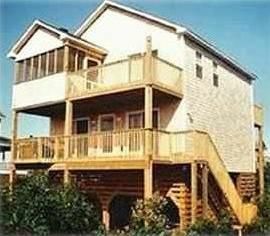 Avon Village is centrally located, has more amenities than any other Hatteras Island location, and is bordered on the north and south by the beautiful Hatteras Island National Seashore (5 mins from the house). You have easy access to the Ocean and Sound Beaches for swimming, surfing, shell collecting, windsurfing, kite-boarding, and many other activities. This area is truly unparalleled on the Atlantic Coast and has been repeatedly named in the top ten beaches in the US. Kick back and enjoy the sunset over the water from the back deck! Kayak around the lake in the back yard. Very convenient to the beach! Lake is great for kayaking - private access - 30 sec walk. Next to pool - membership included with rent. Kinnakeet Shores Pool is open approximately mid-May through September. These dates are not guaranteed. Membership included with rent. Access cards at the house. 3rd stay and we still love it! We love staying at Surfdancer. The views from the upstairs are worth the price of the whole house! We enjoy sitting on both decks and like the convenience of the location as it is close to great places to eat and easy shopping. We brought our bikes and our 4x4 this time and loved heading out to the ORV ramps close by and in Ocracoke. The house is well supplied and was clean and ready for our arrival. The clean up is easy and fast too. We will be back!! This is the third year I have rented this property. It is a close walk to shopping, the beach and a short bike ride to the pool. I have three young kids, ages 10, 2 & 1. They can do the walk to the beach just fine. The kayak outback makes for a lot of fun as well! You wont be disappointed with your stay or location. Clean, comfortable, & great location! The house was perfect & Glen was great to work with. We look forward to going back to the Sundancer again soon! Great time for the family! Easy walk to the beach! House and area are exactly as advertised. Beds are comfortable and house was clean when we arrived. Glen cares about his houses and his customers and is very communicative when needed. No need to hesitate if you'd like to stay here! Don't forget to pick up Uglies from the bakery one morning! Beautiful lake front house close to the beach, sound, and stores. Had an excellent time fishing and relaxing. Great property. Very comfy with our every need supplied. The Surf Dancer is an awesome property. Everything we could have wished for was within steps or short drive. There was something for everyone of the four generations . . . pool, beach, lake, restaurants and grocery store. The house was comfortable for us all to gather as well as spacious enough for us all to go our separate ways. A central location to explore other villages and islands. The weather could have cooperated a little more, but it was nice to be a part of the recorded breaking rainfall since June 1949! Even the rainy days afforded me the opportunity to catch up on some much needed scrapbooking. Definitely a vacation all will remember for many years to come. Glad you enjoyed my house on the wonderful island. Though we all love sunny beach days, there is something so very relaxing about a rainy day in a comfortable house at the ocean (... with a lake water view!). Thanks so much for being a guest and please return! !